charliemiller is music.... inspired by Miles, Monk, McCoy, Herbie and Trane... Ornette, Sly, Jimi, Prince, and many others. charliemiller plays trumpet. 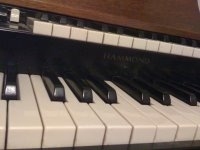 charliemiller plays piano, electric piano, Hammond organ and guitar. charliemiller composes, improvises, arranges and produces music. charliemiller is currently performing with the Trust Quintet at the Mercury Cafe in Denver. charliemiller's initial solo release -- "Vocation" is available now. Find out more about "Vocation"